The ultimate systemic broadleaf weed killer for lawn and turf. New chemistry that’s especially effective on over 200 hard to kill weeds, right to the roots. Visible results in just 24 hours! Rain fast once dry. Reseed in just 2 weeks! Superior cool weather performance down to 45°F extends application window to early spring and to late fall, when weeds are most susceptible. Non 2, 4-D formula contains MCPA, Mecoprop-p, Dicamba and Carfentrazone. MCPA, Mecoprop-p, Dicamba, and Carfentrazone. 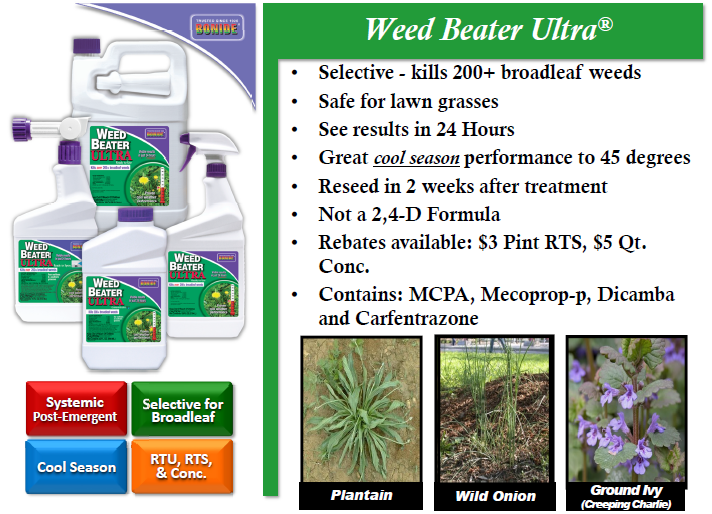 Weed Beater ULTRA has quickly become our #1 broadleaf weed control.